I was going back to Japan for a little short of 2 weeks this time. 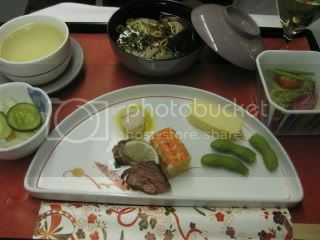 Flight meal was pretty much the same menu as the last time. Main course was Unagi. Because my flight was delayed by over 2 hours, it was already past 8pm when I finally got to Urawa from Narita Airport. As my family warned me, it was so humid and hot when I got there. As usual, we stopped by at a local soba restaurant for a quick meal. 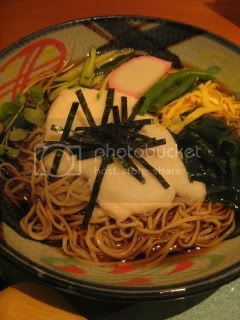 In the hot weather, cold freshly-made soba noodle dish was exactly what I needed. So, I enjoyed this cold welcome dish on my first night back home.